We are studying Ecclesiates in church and it does feel like a season of life is passing for me! Jared's big PSLE exams are finally over. Certainly studying was a big part of it, but more than that, Jared has grown and matured so much in so many other ways :) In my opinion, the Lord allowed a rejection from his dream secondary school, and through it Jared learnt the powerful lessons of humility, teachability, responsibility, working for a goal, and the personal satisfaction of working hard on something and knowing you did well. I know, big words and phrases, huge stuff! He is also learning to Gpray and trust God about the choices - he hopes to try applying for the dream school again when the results are out while also asking Him for guidance about the other two schools where he has been offered a place. Can you imagine, my little boy, facing such huge decisions so well? Me: You know, if you find that you tend to excel at big national exams, you should go to school A.
J: No, I prefer relaxed. Me: Then you had better go to school B, which is a six year program that allows you to skip one national exam! No need to try for the 'dream school'! J: But I prefer interesting. Haha! He sure has his own priorities clearly sorted out! We continue to pray and await God's choice! I so loved to read some of his answers, especially "I am creating... a stable home for the family" Love him! And also some of his deep concerns for Jared showed "I am thankful... for Jared's getting into 2 great schools, what a terrible feeling for him if he had to face rejection at such a tender age", "I am hoping... that Jared will go through these exams with his spirit intact"
And this is funny and so accurate: "Around the house... toys, toys and more toys. a busy house, full of creative activities: stop motion movie making, computer game writing, scrapbooking and tonnes of books." 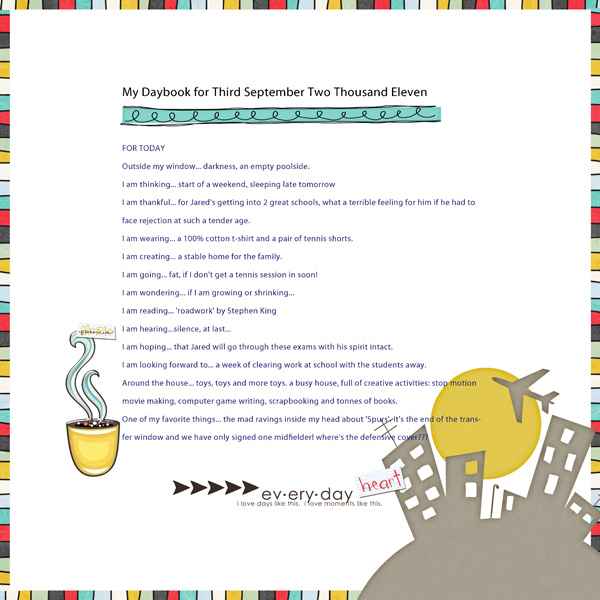 If you haven't, capture your day and your sentiments in a Daybook page and include it in your scrapbook albums! It was so nice to be able to do a post after a long month! I played around in blogger and found that a new series of dynamic views are now available and it looks real cool! Here's a preview, click HERE to try the new view. You can even toggle to different views on the black menu bar there! 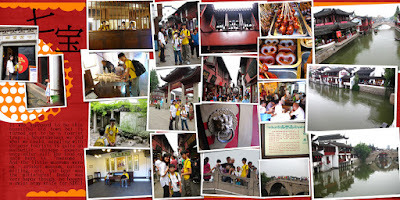 This layout is from a morning we spent in QiBao, touted in the guide book as an original town preserved, but we found it to be terribly turned into a tourist trap! 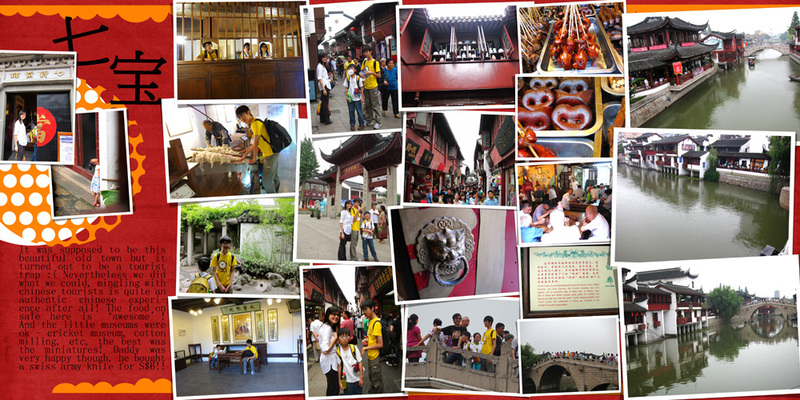 Still, being where the chinese tourists go was interesting, just look at the top two pictures in the second column from the right. Those were pig snorts and baby ducks! I ran from the scene, dh managed to take the pictures, lol! 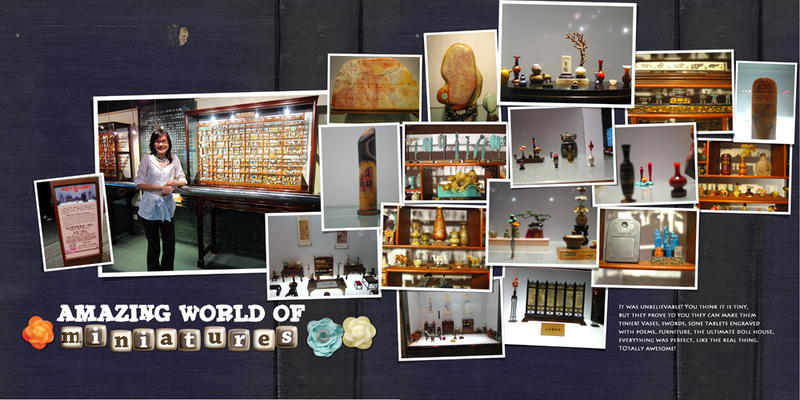 This Miniature 'museum' was also in Qibao, you won't believe how tiny these furnitures, vases, sculptures were! About an inch tall but oh so delicately carved from semi-precious stones, just amazing. 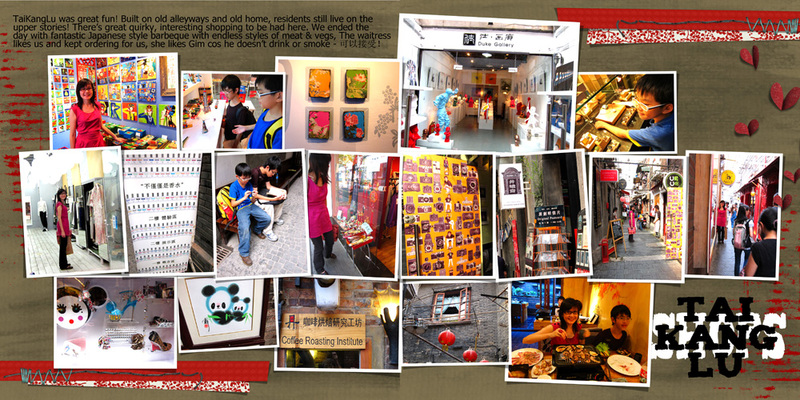 Next we went to a fun shopping space at Tai Kang Lu built into old alleyway homes, it's now has hip and cool shops existing in these old buildings with families still living in the upper stories. 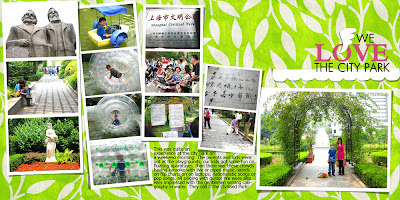 And this was how we spent an authentic sunday morning the Shanghainese way, in the City park. 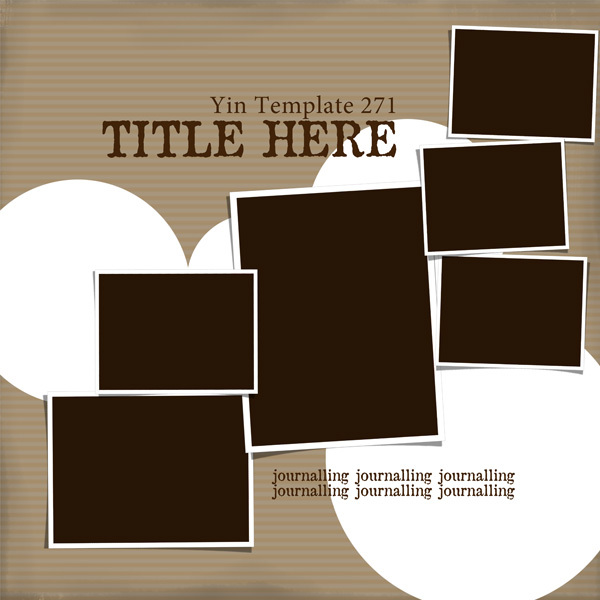 These above layout templates are in the store. 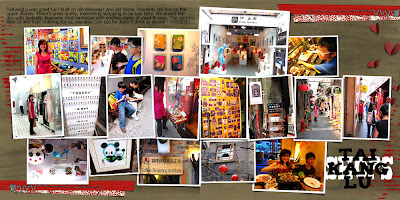 And I bought my first strand of real cultured pearl necklace in this Shanhai market. At least, I hope they are real! The store owner shaved the pearl with a knife, to show me that underneath it is authentic pearl with real sheen and shine. Looks real to me! I loved that I could customise the length and select the individual pearls that I want for my necklace! I always enjoy reading your posts and seeing your layouts. God bless. Super layouts. Thanks for sharing and thank you for the template! 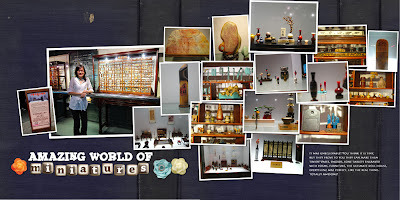 I'll be camping out on your blog tomorrow..I'm teaching a history class about China and I know the kids would love to see 'real life' pictures!! Thanks for the template! You are the best! Thanks for the great template!!! Love the post, praying your son enjoys the school he picks and loved that your husband took part in Daybook journaling, too sweet! 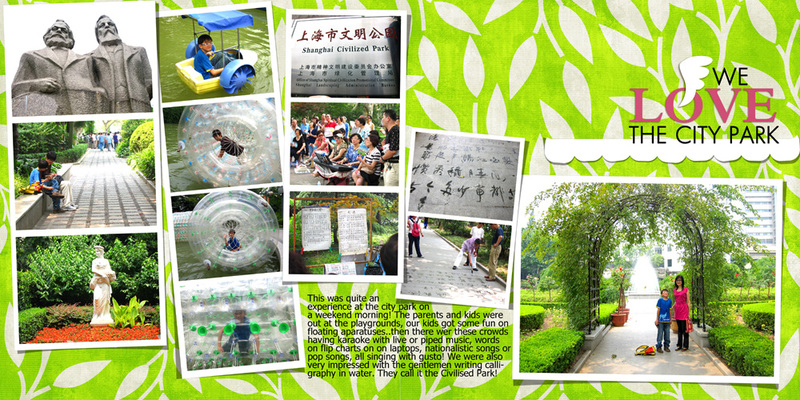 Enjoy seeing and hearing about all the places you visit! Thanks for the template, appreciate it! Thank you for the template, and for sharing what God is doing in your life and that of your family. I love your templates! Thanks so much for sharing. Thank you so much for sharing. Are you doing BSF study of Acts this year? Always love reading your blog and about your sweet family. Thanks so much for this wonderful template, and congrat's on the beautiful pearls! thank you, I Love your templates ! Yes Rhadonda, I will be studying Acts with BSF next year! I started mid way through Acts 6 and a half years ago! And yes Tracey, you're so right, this age really keeps us on our knees! Thank you for your template design. 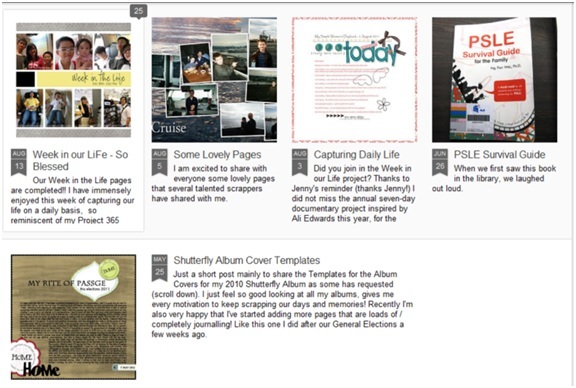 Your templates have helped me so much in creating scrapbooks for my family so that we can actually enjoy the pictures we take. I enjoy reading about your life and the good morals that you have and being so devoted to Jesus Christ. Thanks so much! I love your templates! WoW! that was absolutely wonderful..nice blog indeed. thanks this is what i made out of your template.. Your life stories encourage and inspire me! Thank you so much for sharing your world with me. I love the comment your son made about your home. Priceless. Thank you so much for the templates. Seeing you on the Daily Digi has about convinced me to rejoin. I had stopped my subscription when i lost my job. These little steps of letting go are so hard. Mine are about to graduate college. It doesn't get any easier but they are in God's mighty hands and i am learning to trust that more and more. Hi, there. Thank you for the template. I would love to upload my layout, but I don't know how to do that on your blog. THanks Kathryn for sharing this layout with me, I will put it on the blog the next time I make a post on sharing layouts!